Cocos Island is a breathtaking island located around 500 km off the mainland of Costa Rica. The island is popularly known as ‘Isla del Coco’ in the native tongue of Costa Rica. Bordered by rich and abyssal waters, Cocos Island has become an ideal habitat for numerous pelagic species such as sharks, whales and dolphins. In the late 90s, the island was declared a Marine National Park as well as a World Heritage Site by the United Nations Educational, Scientific and Cultural Organization (UNESCO). Cocos Island’s water is just teeming with a wide array of rich marine life. In fact, divers flock to this island to take a glimpse at one of its main attractions: the constant large squadrons of Hammerhead Sharks! When diving in Cocos Island, one can be assured that encounters with dozens of these Hammerhead Sharks is bound to happen. Cocos Island has more or less 20 dive sites which are pretty close to one another, thus making the island a special and unique playground for SCUBA divers and liveaboard diving enthusiasts. Without a doubt, Cocos Island truly deserves its reputation as one of the world’s finest diving destinations along with the Galapagos and Liveaboard diving is certainly the only way to visit all of its amazing sites! I usually use this website to book in advance my Liveaboards in Costa Rica as they usually have the lowest rates I find. I like it because they have an easy booking system. Situated near the equator, Cocos Island is a tropical island paradise with a warm and humid climate. Average temperature is between 24-30°C. The island has beautiful blue skies, yet heavy rain falls are possible throughout the year. However, divers need not worry since liveaboard trips in Cocos Island are available the whole year round. But if you much prefer to dive in calmer seas and with better visibility, then it’s recommended to do your trip between the months of January and May. If you are feeling adventurous and are keen to get your adrenaline pumping, a dive encounter with the Hammerhead Sharks may just do the trick. The best time to dive with these sharks at Cocos Island is during the rainy months from June to December. 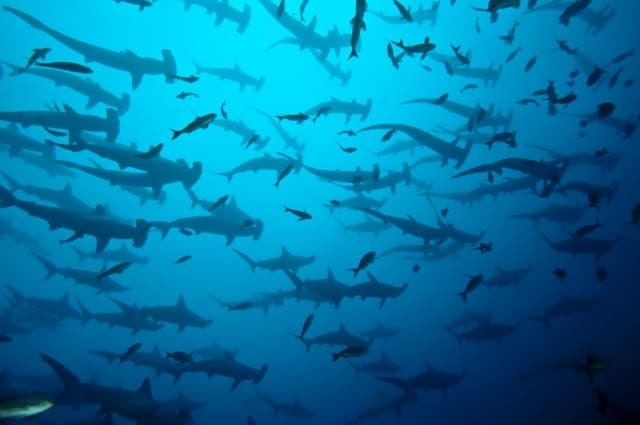 This is because during said rainy months, the high concentration of nutrients in the water attracts the Hammerheads. Cocos Island is not only about the Hammerhead Sharks. The island is so rich with underwater life that divers keep coming back for more. Go check this video to see more! Liveaboard vessels typically depart from and end in the Pacific Town of Puntarenas, which showcases some of the best of Costa Rica’s beautiful and stunning views. Depending on weather and sea conditions, cruising from the mainland of Costa Rica to Cocos Island generally requires more than 30 hours of travel. This means you have ample time to prepare your SCUBA gear and equipment, make friends, socialize, read up about the local marine life, and mingle and get to know your fellow divers! Bajo Alcyone – A 600 feet long submerged mountain with Hammerhead Sharks, Manta rays and lots of schools of fish. Everest -Where a multitude of Hammerhead Sharks and various kinds of rays are seen in action. Big Dos Amigos – An islet that features a 45-foot-high arch and 60-foot pinnacle off the southeast side of Cocos Island. Schools of Rainbow Runners, Snappers and Jacks are very common in this site. Hammerheads Sharks can also be spotted patrolling and swimming in the arch. Bird Island, Chatham Bay – See Frogfish, Moray Eels, White Tip and Hammerhead Sharks in action. You can also check out its cleaning station here. Dirty Rock – A large island where hammerhead Sharks usually hang out in groups. With lots of amazing dive sites to discover, Cocos Island is indeed a place where divers can truly experience real interactions with Hammerhead Sharks and its other diverse array of marine life. Living on a boat is truly an adventure. Most liveaboards will take you to exotic places only visited by few. One of the most popular liveaboards that abound in the beautiful islands of Cocos is the Wind Dancer. Running 10 night trips around the beautiful island, this 37m long motor yacht can accommodate up to 22 divers. 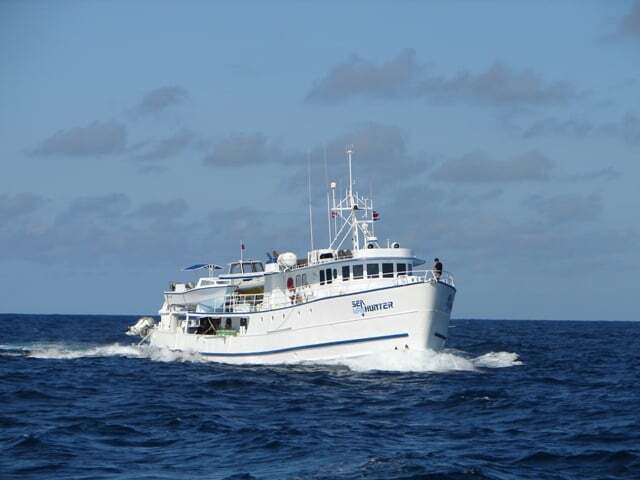 Restored in 2010, the Okeanos Aggressor 2 – Wind Dancer has 11 air-conditioned cabins, each with its own bathroom. Spacious upper deck suites, saloon and entertainment facilities are also available. Wind Dancer not only gives you comfort but also complements your liveaboard diving experience with a little bit of pampering you will never forget! Check out this video to know more about this liveaboard! 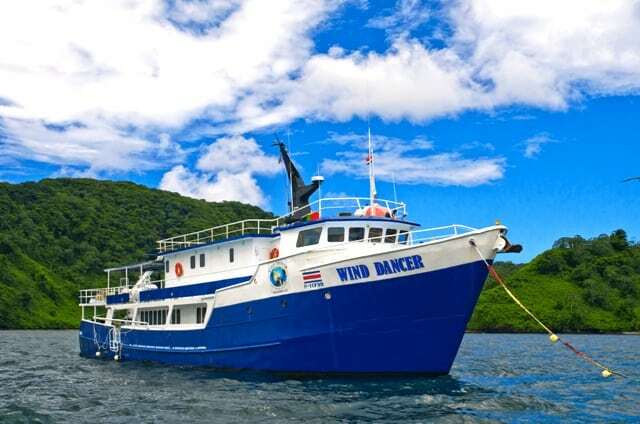 With a very affordable rate, liveaboard diving with Wind Dancer in Cocos Island has never been this comfortable and practical. 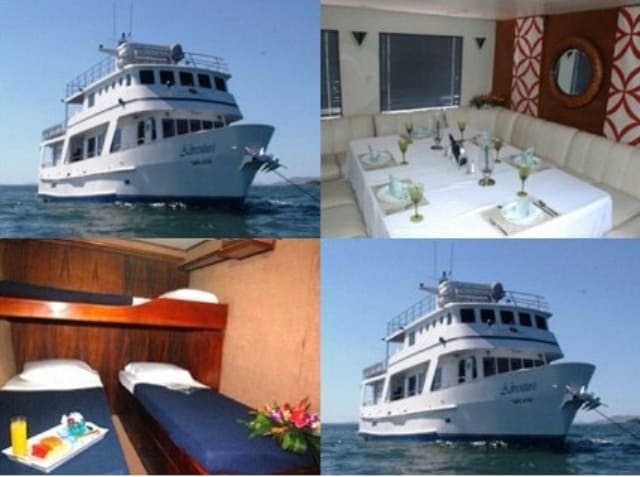 Cruising at a speed of 8 knots, this 30 meter-long liveaboard can accommodate 20 guests and give them the comfort they need but at an affordable price. One of the greatest advantages of diving liveaboard is that you can eat without worrying about preparing meals or how you will cook your food on board. The chefs on board MV Adventure make sure that you are well-fed with yummy meals each day of your cruise. Their meals ranges from local Costa Rican to International cuisine and are served buffet style in the dining area of the main deck. A generous array of entertainment amenities such as a TV, DVD player, music and computer are also available for your use. Along with life jackets and a fire extinguisher, mini personal diver locators are also provided for guests on board for safety purposes. If you are seeking a liveaboard adventure on Cocos Island without sacrificing comfort and style, then consider the MV Adventure. 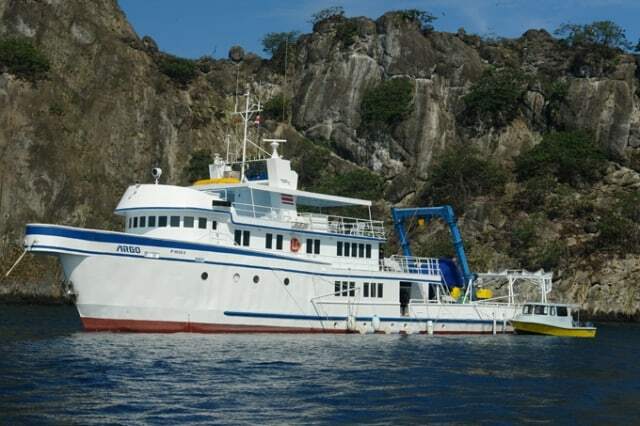 MV Sea Hunter will help you fulfill your dream of diving the pinnacles around the perimeter of Cocos. The spacious layout has introduced divers, as well as underwater photographers to an entirely new concept in liveaboard. With a length of 36 meters, MV Sea Hunter and her crew specialize in providing excellence in service, food and underwater excitement. MV Sea Hunter has extremely well designed facilities fit for long distance trips. The incredible underwater adventures that Cocos Island has to offer must be experienced on board MV Sea Hunter. 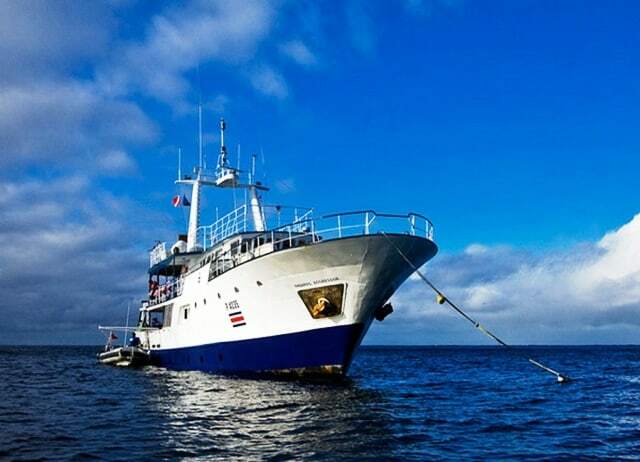 A maximum of 20 divers can be accommodated, which includes air-conditioned cabins, a restaurant and enough deck space to hang out with fellow divers. Do you suffer from motion sickness? Get on board the MV Sea Hunter for they have stabilizers strategically placed under the water to prevent the boat from swaying. Although Cocos Island’s dive sites are remote, divers need not worry because every diver is issued with a personal diver locator, which is clipped to their BCD. This liveaboard also provides a free laundry service to guests throughout the trip. Watch this video and see that with its bursting and rich marine life, Cocos is a magnificent dive spot. The MV Undersea Hunter is a comfortable home away from home. This liveaboard provides enough gear lockers and storage space for all equipment. 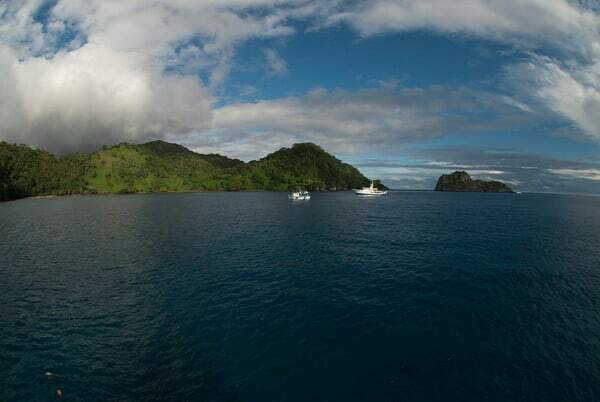 The usual time spent exploring around Cocos Island is 10-12 nights. Guests can be assured that they get the best bang for their buck because of the ultimate luxurious liveaboard diving experience and high-quality service offered by MV Undersea Hunter! With a speed of 9 knots, this boat can only accommodate up to 14 guests, thus giving each one the ample time to get to know their diving buddies well and develop camaraderie. All meals are served buffet style in the dining area. The menu could largely be described as international although you will also be treated to some local Costa Rican specialties. All drinks including alcohol are included in the liveaboard cruise price. Divers can also socialize with each other in the air-conditioned saloon and dining area on the main deck. Full entertainment facilities, communication devices and photo and video editing equipment are available for guests while waiting for the next dive. Coffee drinkers can also use the Espresso machine to give them their daily dose of caffeine! You can expect every comfort on board as well as plenty of breath-taking dive action below the waves when on board MV Undersea Hunter. Cocos Island is a remote, diving destination and you would be at ease to know that you are cruising in safe hands of the experienced crew of the Undersea Hunter. Want to see more proof then watch this video! Okeanos Aggressor has a roomy sundeck, which is equipped with sunbeds/chairs available for guests to hang out before and after scuba diving. Comfort, style and fun adventure are what the Okeanos Agressor offer its guests. Freshly-prepared snacks await divers to appease the post-dive hunger pangs! This 33 metre steel-hulled motor yacht will take you to all the mesmerizing dive sites only found in Cocos. 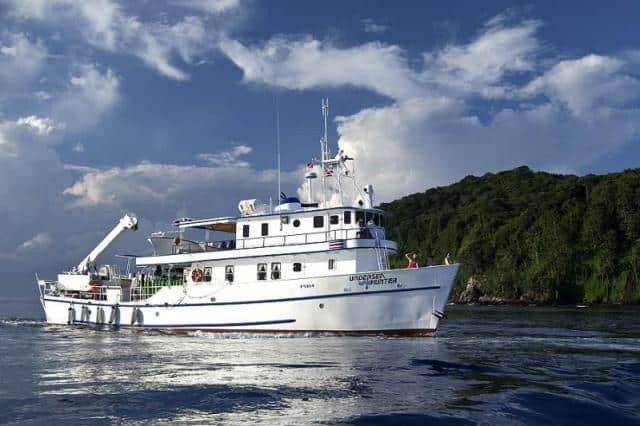 Restored in 2010, this liveaboard can accommodate up to 22 divers giving a satisfying quality service ranging from basic diving assistance to entertainment facilities with internet, TV, DVD and music system which helps pass the time while waiting for the next dive. This liveaboard also has large air-conditioned saloon, restaurant and spacious deck space for sunbathing. American-style and local dishes are served buffet-style on board the Okeanos Aggressor. Play the video to see how the Okeanos Aggressor provide a safe and enjoyable environment to make your their guest’s cruise a fun and worry-free activity. Comfort, adventure and luxury all rolled into one is what MV Argo prides itself on. High quality service and amenities are what sets this liveaboard apart. Built in 2008, this dive boat has a length of 39 metres and a beam of 8 metres. This liveaboard can accommodate up 16 divers, thus, giving each diver a more personalized service and plenty of space to move around. The individual safety of each diver is taken very seriously by the staff. A beacon, which is clipped to the BCD is given to divers to trace their exact positions, therefore reducing the possibility of a lost diver. Your safety is ensured on and off board. MV Argo also offers delectable dishes on board to entice the divers’ taste buds between dives. Since most of the chefs can make modifications to the menu for the guests, you need not worry if you’ve got allergies or special dietary needs. Apart from the air-conditioned saloon, dining and entertainment area, this liveaboard also has a special room where guests can use the computer and internet for free. Photo and video editing equipment are also available. One can also take advantage of the free laundry service as well. This video and see for yourself how this liveaboard can give you the ultimate Cocos Island liveaboard trip you’ve been dreaming of! Lowest Price Guarantee: If you can book the same package any cheaper then you will get 100% of the price difference, guaranteed! Awesome review of the options for diving the Cocos. Its a shame it is such a trek to get there. What season is best for seeing whale sharks at the Cocos? Which of these companies would you say is the most luxurious for the Cocos Island liveaboard trip? We did a 10 day live aboard to the Cocos Islands last year and it was just fantastic! The Wind Dancer is a very nice boat with very lovely and amazing staff. We had a total of 21 day dives and two night dives. During the day dives, we By day we saw a lot of sharks; some hammerheads, whale shark, blacktips, tiger sharks and whitetips. Currents are sometimes strong but we our dive group were all experienced divers so we had very little problem with it. Divemasters and guides were very experience and competent. To give an overview of the boat itself, here is how it’s like: dive deck had large lockers where we placed our fins and other stuff. 3 freshwater showers are situated near the rear dive platform. The boat has a decent camera table, an outside battery charging station and another charging station by the dining area. Food? There was plenty of food during our 10 day stay. The dining area can get a bit crowded though at meal time especially during breakfast and lunch, where foods are served in buffet. Please take that my review of the boat does not return the quality of the dive. For any diver looking for a good dive, Cocos is one of the best places to go to, being a UNESCO World heritage site that includes the surrounding marine zone. And the Okeanos crew gets the job done. The cabins are kept clean and have been well-built but everything is pretty much average. Do not expect lavishness. There is a TV and a DVD player in every room so watching movies can be done without any other people or distractions, which was a big bonus for me. There’s a lot of food for everyone and they always served breakfast, lunch and dinner on time. The food was plain, but satisfying. It wasn’t really something unforgettable which is why I’d be putting in an average rating but definitely not bad at all. The crew always puts on a fair amount of options to choose from anyway. The crew gets a higher score because everybody was quick on their toes to assist the guests with our gears and they were very welcoming. There was never an instance where anybody was rude or unprofessional and one of the dive masters was even extra helpful and showed us a good time. The other crew members though just seemed happy enough in doing their jobs. The Okeanos Agressor is something that could satisfy your diving amidst the lack of luxury. My girlfriend and I spent a week diving Cocos Island aboard the Wind Dancer in July 2014. Diving around Cocos Island definitely is the best when it comes to the sharks I should say. The Wind Dancer maybe an old boat and have not been modernized and refurbished for long time but the crew on the boat was excellent. The chef is good so food is okay but don’t just expect fresh foods. The crew overall friendly, helpful, skilled and customer-service-oriented; they were the best part! The boat is just around 100 ft long but it got 4 decks. The boat is a bit cramped but nonetheless it’s comfortable. Dive operations are very well conducted and safety is very well emphasized. We had 7 days of diving and we saw reef sharks, tiger sharks and of course the main attraction, the hammerhead sharks. This boat also has a good variety of food and the kitchen crew are amazing and well skilled for foods are not overcooked. Even the beef that was served was medium rare which I totally loved! It’s important for everyone to know that diving in the Cocos is not for the inexperienced. A lot of things could change in a matter of a heart beat due to strong currents and surges. The dive trip in Cocos Island Island was a big challenge to my skills and knowledge but definitely something that I would do all over again. All the diving was done by the use of a smaller “skiff” and we never had to take our gears and tanks off while we were there. Our skiff driver had always been exceptional and patiently waited for us to resurface. Well if he hasn’t done so we might have found ourselves drifting half-way to Galapagos! Gears were well taken care of after each dive and tanks were always filled. All we had to do was go off the skiff, shower and find our way to where the sweet-smelling food was. We were pampered by the professionals on board the Undersea Argo and I have great respect for our captain and dive masters. Lady luck must have been on our side the entire time that we were on the MV Undersea Argo. Our dives had always been productive with thousands, yes, thousands of reef fish busily swimming along with us. There were schools of hammerheads everywhere that it became a problem looking at anything else as they’ve practically blocked other fishes. And the night dive with the whitetips was like a scene I’ve seen only in professional videos. It was breath taking to watch the whitetips on a feeding frenzy at a night dive. These sightings proved to be rewarding by the special guests that came with us and there were actually two groups– camera crews from Japan and France who were doing professional shoots. They were very nice and didn’t hesitate sharing their wonderful photos with us. Talking to them post dives were very enriching. Does anyone do a 7 or 8 day liveaboard trip in the Cocos Islands? Thanks. UnderSea Hunter was the best! Cocos Island lies about 320 miles south west of Puntarenos on the Pacific Ocean side of Costa Rica and it took us a day and a half to get into the island but I enjoyed it since it was a different experience to be surrounded by water all the time. It was also the opportunity for us to familiarize ourselves with the boat and everyone else. The dive deck was large enough to accommodate all 20 divers on the MV Undersea Hunter. It also had designated storage bins for gears and a sufficient number of electrical outlets to allow the divers to recharge their camcorders easily. The crew can also easily provide rental equipment, should anyone wish to use any and really cam handy when someone forgets a piece of equipment. Personally though, I would recommend bringing your own equipment. We enjoyed the various dive sites teeming with different kinds of sharks, mantas, jacks, orcas among other. Turtles used to be present at the dive sites but we had some problems seeing them as there were a good number of Tiger sharks on the area. Tiger sharks love to feast on turtles, which probably why the turtles didn’t turn up on our last dive. I guess it is also important to note that the MV Undersea Hunter staff would always prepare mouth-watering treats after each dive. We did a 10 days trip aboard the Wind Dancer, touring around the Cocos Islands. The boat was lovely and comfortable. The staff was friendly, accommodating and also very professional. We sure can tell that their knowledges of the area are limitless and they take pleasure in educating new comers. We completed 22 dives, 2 were night dives. In general, the current is strong so be sure you are experienced enough, we found it hard but we were lucky to be surrounded by almost only dive masters so everybody was helpful. Also, some dives we spent hanging by a wall to only observe the sharks, Dolphins and rays from a certain distance. It was pure pleasure! Diving around the Cocos Islands is definitely a paradise for sharks enthusiast! Hammerheads by tons, 3 whale sharks, loads of black and white tips reef sharks, many Galapagos sharks and we saw a Tiger Shark twice. I could not believe my eyes. There was, of course, so many other schools of fishes. One more thing, I found very reassuring that the Wind Dancer’s diving team was aware of the threats faced by the marine life in this area and I was happy to see that they actively encourage people to learn about that and to be very respectful of nature, both in and out the water. Great experience on the SEA HUNTER! 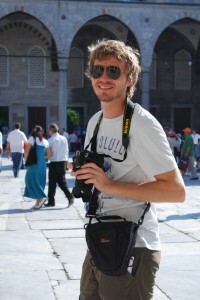 I am an experienced diver and I spent the last few years diving all over the world, literally. Diving around the Cocos Island is certainly not a beginner’s business, the currents are way to impossible. The incredible concentration of fish is indeed very impressive. It’s like if all the pretty diving pictures we see everywhere were shot here, around the Cocos. White and black tip sharks, Galapagos, hammerheads, amazing turtles, barracudas and much much more. The island is wonderful and majestic. Uninhabited, pristine and boasting a beautiful waterfall in it’s core. It’s worth getting on land and exploring the island, I encourage the most adventurer to go. The organization on the Sea Hunter is extremely professional and designed for underwater photographers. The cabins are comfortable and the food varied and good. I was delighted to be awaken in the morning by the smell of the breakfast being cooked for us. The boat is comfortable, lots of space that you can enjoy and relax. They have a big screen and a good choice of DVDs you can watch. It was a long and exhausting trip to get to the vessel but I would do it all over again tomorrow if I could. Stayed a bit in San Jose to cut the travelling in half and then headed to Puntarenas to board this beautiful boat. It’s a once-in-a-lifetime experience that I fully recommend to all the experienced divers of this world. Long, exhausting journey aboard the Okeanos Aggressor to the Cocos Islands but definitely rewarding. As a shark lover, I feel like I have seen everything I could hope for. More than once we have been able to observe a huge group of Hammerheads and this alone is enough to make the trip worthy. But, it was way more than that. Hundreds of reef sharks, a dozen of Galapagos sharks and 2 tiger sharks. All are very fascinating creatures, all in different ways. Turtles, many schools of fish, wonderful corals and beautiful landscapes. Being on the Okeanos Aggressor for an entire week was comfortable and enjoyable. The boat is great. The crew, professional and friendly. Food and service impeccable. The entire cruise is well driven, focused on safety and providing a great diving experience. I also did a 10 days liveaboard on the Cocos’s island. I was on the Argo, but I’m afraid my experience was not as enchanting as many. The price is actually way to high for the services we get on this boat. It’s almost 500$ per day, per guest and the service was extremely ordinary. Seemed to me that everything was focused on the submarine for those who dive the big depths. I was clearly paying for all this tremendous submarine operation which I have no interest in. Then I thought maybe I just came on the wrong boat because they did not meet what I call luxury. My cabin was so noisy, like SO NOISY, even with earplugs it was hard to sleep. There’s was a poor service in cleaning, I think it was only one person that had the impossible tasks of doing the rooms and getting towels and the lunch and dining area ready. It doesn’t make sense to me. Whether they need to rethink their priorities and make that clear or whether I need to consider another boat next time.